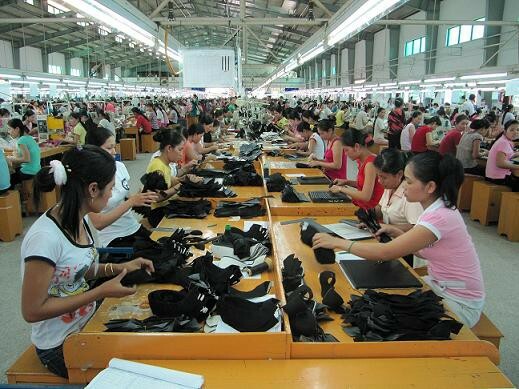 A wholly-Taiwanese leather shoes company in the southern province of Tra Vinh has announced plans to lay off more than 10,000 workers right before the Lunar New Year holiday due to export difficulties. My Phong Leather Shoes Ltd. Co., which has three plants in Tieu Can and Tra Cu districts, now has roughly 19,000 workers compared to the initial figure of 28,000. Workers at My Phong Leather Shoes Ltd. Co.
On Tuesday, the company has announced that 10,142 workers would have to stop working from February this year as the company’s partner in the US has gone bankrupt, affecting nearly 70% of its export contracts. The Tra Vinh Confederation of Labour has sent three delegations to the company for supporting the workers. After working with the confederation, the company’s management board has agreed to ensure the employee rights before they are dismissed. The workers would be given Tet bonuses and salaries for January and February. They will be also instructed how to claim social insurance and unemployment benefits. Some 600 female workers who are pregnant or on maternal leave will not be laid off. Provincial trade unions will contact local job centres to help the affected workers to find new jobs. My Phong Leather Shoes Ltd. Co. was set up in 2005 and mostly focuses on making women's shoes for export to Europe and the US.